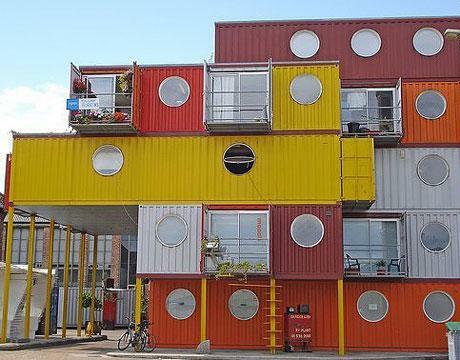 Shipping container architecture can be used for many different applications, from apartments to studios, classrooms, offices, and even music recording studios. 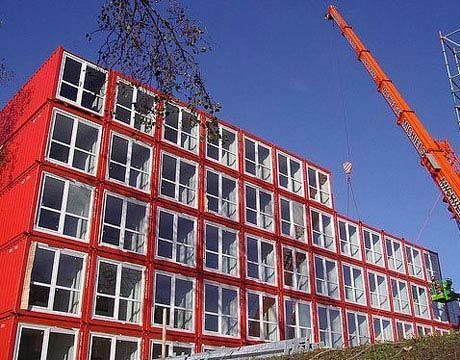 building with shipping containers can be an affordable way to provide high-quality housing. There are countless numbers of empty, unused shipping containers around the world just sitting on shipping docks taking up space. The reason for this is that it’s too expensive for a country to ship empty containers back to their origin. In most cases, it’s just cheaper to buy new containers from Asia. The result is an extremely high surplus of empty shipping containers that are just waiting to become a place to live and work, especially with the green premise growing in popularity across the globe. 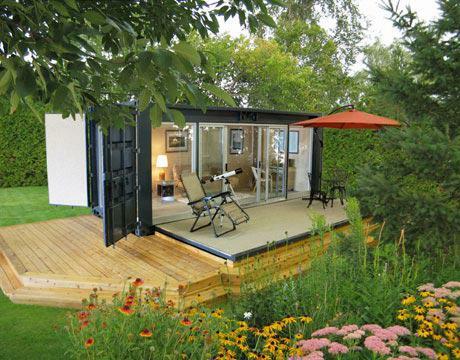 So more and more people are turning to cargo container structures for green alternatives. 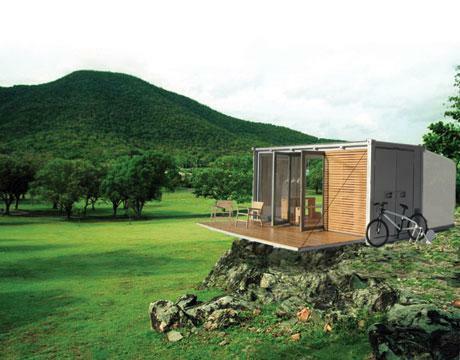 The Ecopod is a container home designed for on- or off-grid living. Made from a shipping container, an electric winch is used to raise and lower the heavy deck door (power is supplied by a solar panel). The floor is made from recycled car tires, and the walls have birch paneling (over closed-cell soya foam insulation). The glass is double panned to slow heat transfer. The Ecopod can be used as a stand alone unit or with other structures. It is designed to minimize environmental impact. All Terrain Cabin is a small home which is based on a standard shipping container, and is said to be suitable for a family of four, plus a pet, to live off the grid in comfort and style. The cabin folds up to look like any old shipping container, and can be sent via rail, truck, ship, airplane or even helicopter. When you’re ready to rest your bones, the cabin quickly unfolds to 480 square feet of living space, with a range of creature comforts. Studio Arte has been exploring the notion of nomad living in their architectural practice, resulting in a series of shipping container structures that they see serving a multitude of purposes: a start up for young home owners, a holiday home, a concept for holiday resort planners, a shed for guests, a home office, a home studio, a pop-up, or a hotel room. The shipping container is one of several unusual interventions introduced by South African firm Inhouse Brand Architects, which was tasked with converting the top three floors of a new development. The concept for the interior focuses on separating the work spaces from breakout areas that facilitate communication between employees and can be used for meetings or informal teamwork. Billed as the largest container city in the world, Amsterdam’s massive Keetwonen complex houses 1,000 students, many of whom are happy to secure housing in the city’s tight real estate market. Designed by Tempo Housing in 2006, Keetwonen is said to be a roaring success, with units that are well insulated, surprisingly quiet and comfortable.Each resident enjoys a balcony, bathroom, kitchen, separate sleeping and studying rooms and large windows. 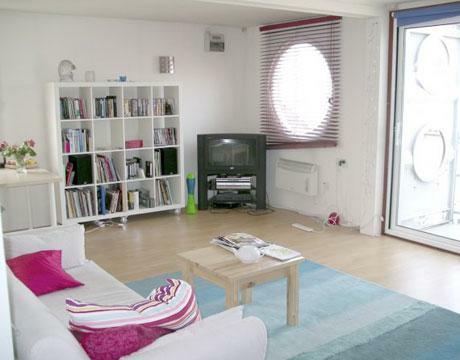 The complex has central heating and high speed Internet, as well as dedicated bike parking. 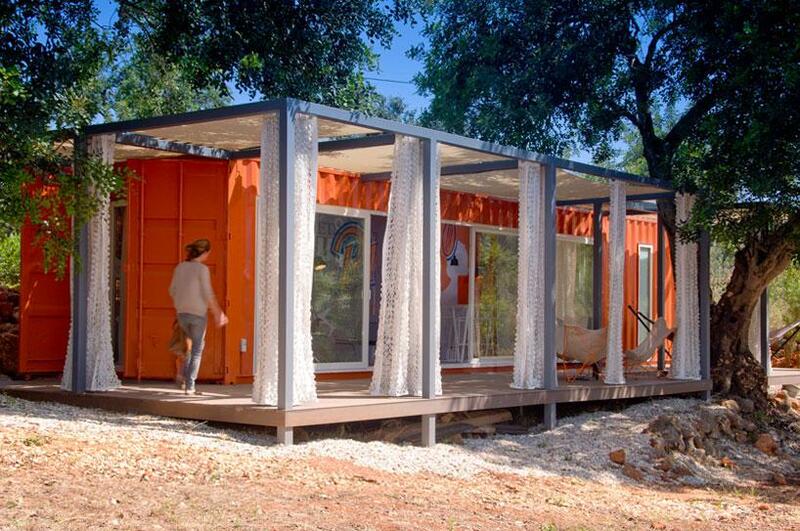 A great example of utilization of space in a shipping container architecture. 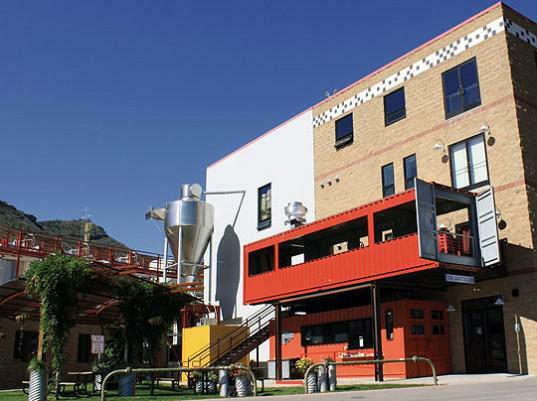 Patrons of Ska Brewing’s World Headquarters & Tasting Room in Durango, Colorado, have a new menu to consider while sampling Ska’s craft beer fresh from the source. The Container Restaurant, made from two re-purposed shipping containers stacked on top of each other, opened last August to plenty of fanfare. The restaurant features food made from scratch to complement Ska Brewing’s beer tasting experience. In summer, the upper container provides elevated, outdoor patio seating for dining and drinking al fresco. Container City Building I was a success, and Urban Space Management added an addition, dubbed Container City II. Reaching five stories high, Container City II is connected to its earlier iteration via walkways. It also boasts an elevator and full disabled access, as well as 22 studios. 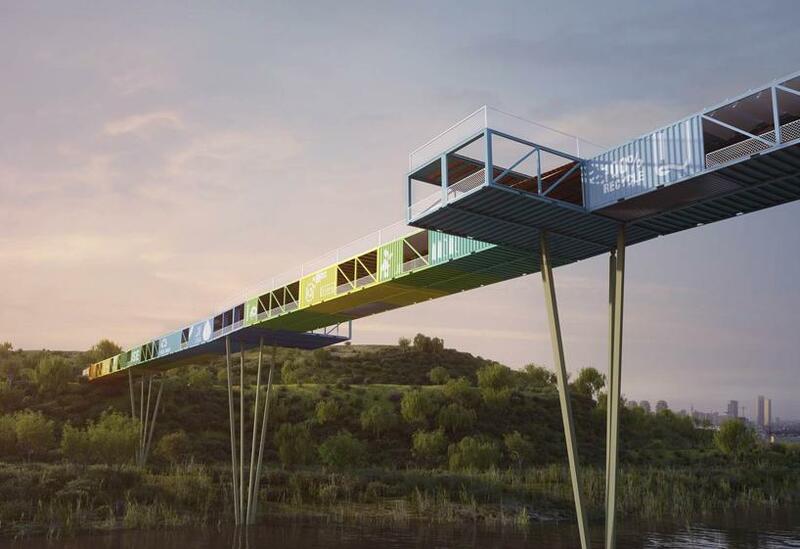 ECOntainer bridge by Israeli practice Yoav Messer architects, will soon be under construction in Ariel Sharon park, a nature conserve rooted in the ideas of environmental ecology and sustainability. The deck will accommodate pedestrian and light vehicle traffic, freeing the roadways for vehicles and improving the flow of both. The containers’ architecture of modular characteristic makes it ideal for replacing or repairing parts, modifying certain points of the design, and using the natural proportions to frame specific views. Buenos Aires-based BBC Arquitectos designed the shop for fashion brand Le Utthe, with four shipping containers suspended from the ceiling contain displays of merchandise inside this clothing store. 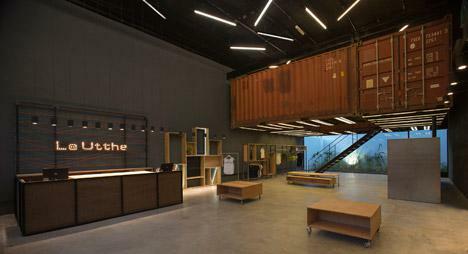 The site’s proximity to the port of Ensenada informed the industrial aesthetic applied throughout the interior, which is embodied by the weathered steel surfaces of the shipping containers. A staircase made from slanted steel sections with the same I-shaped profile as the ceiling beams ascends through an opening in the base of one of the suspended containers. Once inside, shoppers can wander through the interconnected boxes and browse the different displays. Situated on a peninsula in North-Eastern Antarctica, the ‘Bharati Antarctic Research Station’ by Hamburg-based Bof Arkitekten presents a self-sufficient energy facility comprising 134 shipping containers wrapped with an insulating metal skin. the development is conceived as an architectural volume that can be readily dismantled due to restricted accessibility within the region. With its modern lines and appealing spaces, the award-winning Redondo Beach House by De Maria Design turns heads. This example of shipping container architecture was built from eight prefabricated, recycled steel shipping containers, along with some traditional building materials. According to the architects, the modified containers are “nearly indestructible,” as well as resistant to mold, fire, and termites. Seventy percent of the building was efficiently assembled in a shop, saving time, money and resources.